Hi everyone, I’m Martha, a soon-to-be third year undergraduate studying English at Brunel. A few weeks ago, I started up a blog on WordPress in the hopes of creating a magazine-style website which showcased the work of young, aspiring writers and journalists. Interestingly, I was initially inspired to start this up after my time managing the @BrunelWriter Twitter feed, where I discovered the importance of students needing a chance to write for competitions, magazines and websites and so have something to showcase to potential employers as evidence of their writing apart from personal blogs or university work. As an aspiring writer/journalist myself, I had learned how vital is was that I wrote for other platforms and had evidence of engaging with different companies through the written word – so I set out to create a similar kind of platform for other students of a similar age and below who were also seeking such opportunities, giving them the chance to feel part of a new community of like-minded aspiring writers and journalists. I named the website Devise – I know, it’s not very original – but the word ‘devise’ brought to mind images of planning, thinking and creating, and this is the kind of ethos I wanted the website to take on. The concept of Devise is quite simple: we’re giving our voluntary and unpaid writers the chance to both write articles for us but also, better their writing while doing so. In return for our writers’ weekly contributions, myself and our Senior Editor Simran proof-read, edit and then provide feedback on their articles, suggesting room for improvement and helping them to get new and exciting ideas for their articles on the website. We aim to help these young people with their writing as they progress through their studies and strive to become professional writers or journalists in the future. Although the website was initially aimed at young people – so those aged perhaps 20 and below – we’ve now taken on a few writers who have graduated from university and are in fact, full-time professionals. For example, two of our writers are graduates who work in PR and another two are graduates working with other magazines. This has proved the success of Devise as a website that appeals not just to students, but other keen writers who simply wish to contribute articles and help us grow. The mix of writers at Devise is fantastic, and although we are still targeting young people, we take on board those who simply wish to engage in their passion for writing. The sections Devise currently has on the site include arts and culture, lifestyle, entertainment, fashion and beauty, sports, travel, food and reviews – and we expect the sections to grow as we take on new writers. We are always on the lookout for writers and with 16 writers currently contributing articles to the website, our team of editors is set to increase too. Devise started off with small-scale intentions but is now developing into something amazing. 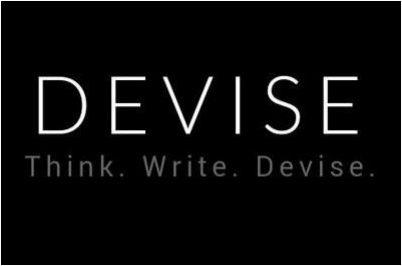 If you are reading this and wish to gain writing experience on a voluntary, unpaid basis, feel you would benefit from getting writing experience and feedback on your writing or simply want to get involved as a writer, then email us at deviseblog@yahoo.co.uk. We also have a Twitter account that you can follow for updates and new articles: @DeviseBlog. Lastly, please take some time to visit the website and read a few of the articles written by our outstanding writers. Remember, if you see yourself as a Devise writer, then get in touch!